> Balihoo > Ensure Your Products Are Found Online - Increase Sales! As with a national brand's corporate website, local websites serve as the centerpiece, or hub, for all other local marketing tactics - both online and offline. Local websites serve as the centralized landing pages through which all of the other tactics can be driven, tracked and measured. For national brands, having a local presence online is now imperative to ensure that consumers can find their resellers at the local level. 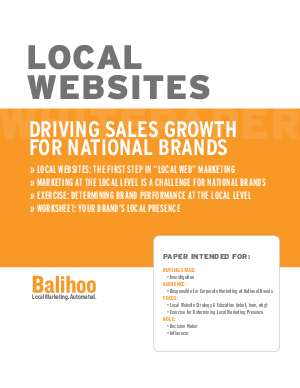 Learn how national brands can automate the development and management of local websites to ensure their products and resellers are found online and to drive market share, leverage the importance and strength of local markets, and increase marketing ROI.